Gifts of Gratitude: A 31 Day Challenge! I know you have experienced many challenges this past month. I have too. There have been highs and lows globally and in my business and personal life. I, like you, have experienced conflict(s), worry, grief, fear, and uncertainty. But I have also experienced happiness, joy, love, appreciation, and success. It is easy to let the difficult times swamp the good times. Difficult times are hard; good times are easy. By focusing on difficult times we allow them to become all-encompassing. With December fast approaching, the whirlwind of the holiday season will soon be upon us. As our days and nights get busier, it is easy to lose sight of what is really important. December also invokes joy and love; which is what I am choosing to focus on this year. For those that celebrate Christmas, December brings with it a sentimentality that is not experienced at any other time of year. We become reminiscent of tradition and times spent with loved ones. We have memories of Christmases when we were young, the excitement and joy of baking, wrapping, family, and gifts. This tradition of gathering with those that are close, be it friends or family, can also bring up emotions of sadness and regret. If you have lost someone special and/or have conflicts with family, Christmas can be a difficult time (for many other reasons as well). The busyness of the season can sometimes sweep me away. I am working on being mindful of my days and moments. I also need to turn towards more self-care, something that I have been recently ignoring. Without self-care, I am headed for burn-out. And for me, the most effective form of self-care is qigong. When I am taking care of myself, feeling good and sending out high vibes, it affects everyone around me in a wonderful way. It follows then, that more good things come my way. But self-care comes much easier when my vibration is higher. Have you noticed that when things are not going well, it’s easier to let the self-care slide? 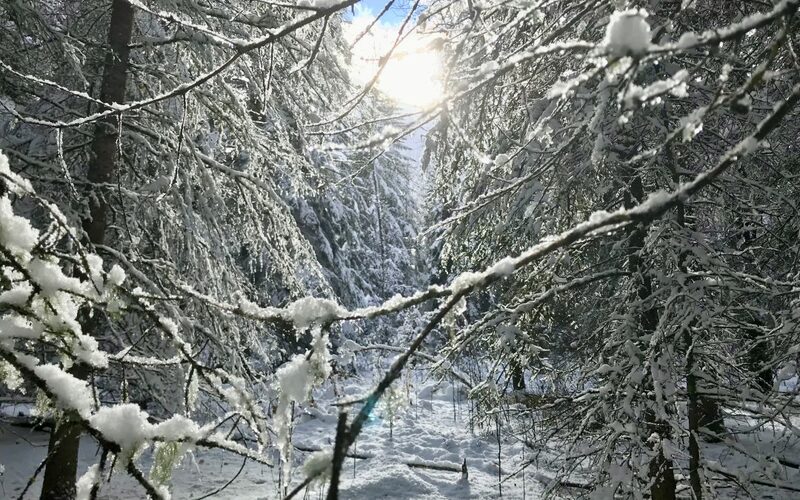 In addition, according to the Five Element Theory of Chinese Medicine and Spring Forest Qigong teachings, the negative emotion associated with the season of winter is fear and the positive emotion is gratitude. If you are feeling fearful, gratitude is the antidote. Because we are coming into the season of winter, the energy of fear can be strong, but so is the positive emotion of gratitude. What this also means, according to the Five Elements, is that by feeling gratitude we can also help to heal and support our kidneys, bladder, ears, reproductive organs, feet, and bones and bone marrow! December is the perfect time to focus on gratitude! A few years ago, I created the Gifts of Gratitude Challenge for the month of December. It became a bigger gift to me than I could have ever imagined! Many of you joined me, and for that I am grateful! Reading what others are grateful for instantly boosted my mood and made me smile each day. Want to join in the fun? The challenge is to find three things you are grateful for each day throughout December. Expressing gratitude always makes me feel good. By sharing my gratitude with others, and hearing what they, in turn, are grateful for, collectively raise all of our vibes even higher. In addition, by publicly declaring to such a “challenge”, we are all supported and accountable. Daily gratitude sharing can serve as a touch point to ground us to the here and now; to keep us focused on all that is good and right with the world; preventing us from getting swept away in stress, fear, sadness, uncertainty, or grief. Please join me December 1­–December 31 for the Gifts of Gratitude Challenge. Find three things you are grateful for each day. Post them publicly on Facebook and share them in our closed Facebook Group. Use the hashtag #giftsofgratitude. By posting them publicly, you will encourage others to join in on the fun and also raise their vibration as they read your post! If you are not on Facebook, use a journal and share it with a friend. If you are on Instagram, take a photo each day representing one (or all three) thing(s) you are grateful for. Use the hashtag #giftsofgratitude. By adding a hashtag to your post or photo you can search all other posts that are part of the same challenge. You can follow me on Instagram here. Consider this a gift you are giving the world. Imagine if your news feed was more about gratitude and less about politics and war! Don’t underestimate your ability to influence the collective consciousness of our planet. Together our energy is very powerful! I am excited to experience a December with more happiness, joy, and gratitude than ever before! I hope you’ll join me! UPDATE! For those of you who would like to add in 31 Days of Qigong to your month, join me over here for 31 days of support to make December even better!! Whoot! I’d love to hear in the comments how gratitude has helped you overcome a challenge. Want some help with this? I can help you see through the fog and find the good. Contact me for a free strategy session. I help women balance and heal, creating space for happiness, connection, and love. At times, we can be stuck in a place that has become normal: digestive issues, fear, anger, PMS or menopause symptoms, negativity, or maybe something seems to be missing: meaning or purpose. By removing blockages and making some deep changes, our lives can return to a place of balance. That’s where I come in. When we are in balance our energy flows smoothly, we feel good, and our intuition can be heard. It is then that we shine our brightest! If this feels like something you need, schedule your distance healing session today. In addition to distance healing, I am a Certified Spring Forest Qigong Instructor and Master Healer. I enjoy teaching workshops and webinars on the energy of the seasons, healing, and Qigong. I live in beautiful Sunset Beach, AB, Canada. WOW !!!! Sue this resonates so much with me at this specific moment. All I can say right now is thank you for sending this out ………..
Been practicing gratitude journal since…let me look…..July 18 2018 I write 5 things I am grateful every morning and what a difference it makes in my life. Hi Helene! Thank you for your commenting. Congratulations on your gratitude practice! I would love to hear more about what differences you have noticed in your life. It’s interesting how this emotion supports the water element and our kidney and bladder meridians. Gratitude creates a powerful positive vibration in the body, doesn’t it? I like this gratitude challenge. I realize I ve got more than 3 things daily i n grateful for. I realize I m lucky but when I ve got to deal with my inner sorrows I forget everything. Thank u to have reminded me to focus on good things. Thank you for your comment Lorella. It is easy for the sorrows to take over. Starting a journal dedicated to daily gratitude may be helpful. I find it gets you thinking grateful thoughts more often. Also going back and reading my past gratitudes is very uplifting, as is reading others’ gratitudes as in our Facebook Group. Please join my mailing list to receive my latest posts!